It was bad enough for Apple(s AAPL) when its new Maps app’s awfulness was inspiring parody Twitter and Tumblr accounts. But now the app is forcing public safety officials in Australia to issue warnings about it. On Monday, police in Victoria, Australia took the step of issuing a bulletin and asking travelers to the area to use a different mapping software. Turns out, those using Apple Maps are often led astray in a badly mis-mapped national park, and police had to keep rescuing lost, stranded tourists. 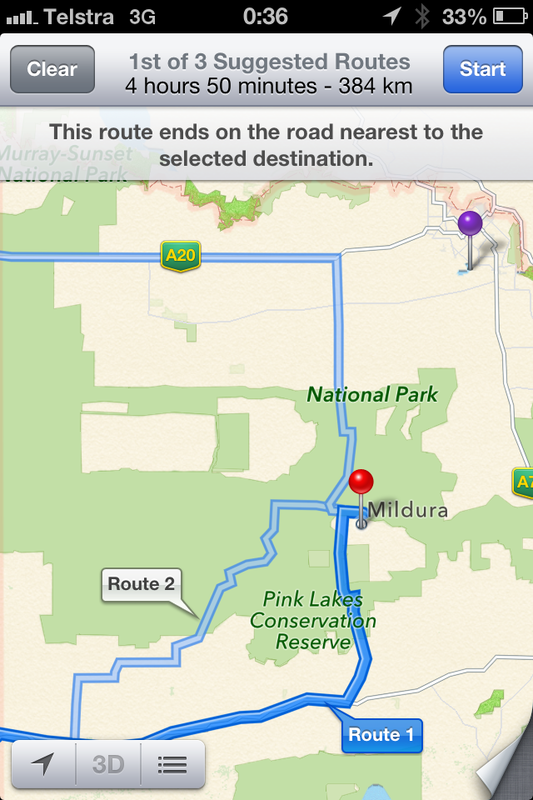 Tests on the mapping system by police confirm the mapping systems lists Mildura in the middle of the Murray Sunset National Park, approximately 70km away from the actual location of Mildura. Some of the motorists located by police have been stranded for up to 24 hours without food or water and have walked long distances through dangerous terrain to get phone reception. Bad directions and misidentified locations are usually just inconvenient or annoying; they do not usually lead to life-threatening scenarios. But in certain cases like this one, they can be, which is why Apple needs to get a fix in place as soon as possible. Apple is reportedly working to improve the bad imagery, misidentified locations and off-target directions. But this is not exactly great PR for the company and its brand new Maps product. The sooner the details of this “huge plan” are revealed and implemented, the better. Erica, I think you’ve been a little too eager to hammer Apple for the errors in Maps. It’s okay to point out mistakes but you go a lot further with phrases like “new Maps app’s awfulness.” A more objective source like Consumer Reports says that Maps does have errors but is generally okay. How about avoiding the sensationalism about this product? It doesn’t get you any respect from this reader. It’s not sensational to call an awful app awful. This is the same app that resulted in no less a person than the CEO of Apple issuing an apology. It even forced the CEO to recommend rival apps/services as an interim solution. It is the same app that resulted in some high-level firings within Apple. It is the same app that is causing untold problems to users, including putting them in life-threatening circumstances. Who knows how much time and money has been lost by users worldwide? How much more awful do you want it to get before you think ‘awful’ is an acceptable adjective? You want it to jump out of the phone and start eating babies? Unfortunately, the Apple Maps is awful. In Tokyo, the world’s biggest city, it places all stations in the wrong places and cannot find basic addresses. The examples are endless. It may fare ok in US but overall it’s close to useless. In Wyoming, we see stories similar to this at least once each winter…except that the guilty GPS is a dedicated device. It might sound improbable to some, but in WY where the distances are vast and the open space enormous it is always wise to carry winter survival gear and supplies — printed maps, sleeping bag, candles, food, shovel, gasoline. My guess is smart folks traveling the outback in Australia are equally prepared. Not to excuse Apple, but a little perspective might be useful.